Essential oil bottles? If you’re like most people, you haven’t given them a second thought. But if you use essential oils in your profession, or if you’re thinking about dipping your toe into the lucrative market of making and selling essential oil concoctions, your bottles are more important than you think. There are several types of essential oil bottles and each one serves a slightly different purpose. In addition to different sizes and shapes, you have to think about the materials. Different colored glass will affect your oils differently. And what about the caps? Rubber, plastic, stopper, dropper, or roller? Each of these can affect the shelf life of your oils, the convenience of use, their attractiveness for customers, and more. It’s not “just a bottle.” If you choose the right one, it can make a huge difference for your oils and for your business. Essential oils need to be stored and handled correctly. Essential oils oxidize, and they tend to lose their therapeutic value over time. All the more reason for you to choose and buy the right essential oil bottles for storage. Essential oils are best stored in dark colored bottles, such as amber or cobalt blue, to protect them from ultraviolet rays. The sun’s rays can damage your oils, which is why you should avoid clear essential oil bottles. Your choice of essential oil bottles might also be limited by the product that you have. For example, most oils only need a regular .17-ounce or 0.34-ounce container. More expensive ones might fit into cheaper and smaller dram bottles. If you’re creating creams infused with essential oils, then you might need to buy jars. Aside from clear bottles, you should also avoid buying bottles that have a rubber dropper included in the cap. Highly concentrated essential oils can eat away at the rubber and turn it into a gummy mess. That gum will then damage the essential oil inside. Buy something with an orifice reducer, instead. An orifice reducer helps to regulate how much oil comes out, and also helps to keep the air out of your essential oils. Perhaps you want a container that will make it easier for you to mix essential oils with a carrier oil so that you can apply it topically. In these instances, you can choose either a roller bottle or one with a glass dropper. Most people use Boston round bottles to store their essential oils, but there are other types available. If you’ve seen a traditional medicine bottle, then you know what a Boston round bottle looks like. Boston round bottles are usually amber-colored, and this helps to protect your oils from oxidation and extend their shelf life. You can use a variety of toppers with a Boston round bottle, including reducers, droppers, rollers, and sprays. These bottles are the standard when it comes to essential oil products. Dram bottles are great for samples. They also come with a dropper for accurate measurements. These are smaller bottles than Boston round bottles. Perfume companies often use these tiny bottles for perfume samples. Euro bottles often come in different sizes and are available in either amber or clear glass. They work with a variety of toppers, but usually come with droppers. Euro bottles are most often preferred by those who diffuse their essential oils because the included dropper makes it convenient for them to measure the drops. The roller-ball caps of roller bottles allow users to roll your product onto their skin. These bottles come in different hues and may have, glass, plastic, or stainless steel roller balls. 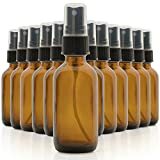 To compile a list of the best essential oil bottles, we checked out the various listings on Amazon and chose the best and most highly rated products. We included bottles from different categories and used for different use cases. Blending, storing, selling, using — you need the best essential oil bottles, and you need them now. These are professional grade containers that you can buy for your essential oils. These bottles have a capacity of about half an ounce and are both shock- and corrosion-resistant. The amber tint of the durable glass will help protect your valuable oils from ultraviolet rays. These glass bottles come with a tight cap to ensure that your oils do not leak out. Using the glass stopper, you can easily take out the amount of oil you need. The company also offers a money-back guarantee if you aren’t satisfied with your purchase. 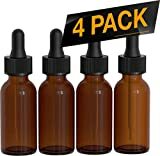 This set of essential oil bottles gets a rating of 4.9 stars out of 5.0 on Amazon. People like these bottles for their durability and elegant look, while some mention how well the glass stoppers work. There are also those who commend the seller for their outstanding customer service. However, some reviewers warn would-be buyers that these are smaller than the advertised size and it will not fit 0.5 ounces of your oils. Pricing for the Nylea 24 Pack Essential Oil Bottles ranges from $$ to $$. The Amber Dark Brown Glass Spray Bottles from 1790 is a set that comes with two 16-ounce bottles, two caps, two sprayers, and four labels. These amber bottles can help keep your essential oil products safe from UV rays. These bottles are perfect if you are using essential oils in cleaning liquids, or if you need to store a lot of it. The trigger sprayers have three settings to help you control the flow. The sprayers can dispense liquids in a mist or a stream. You can also turn the sprayers off so that your essential oils do not leak out. The sprayers are guaranteed not to clog. These bottles are also lead- and BPA-free, which makes them safe to use even when you’re preparing food. They’re also washable and reusable. Finally, they come with a money-back guarantee. The 1790 Amber Dark Brown Glass Spray Bottles get an average rating of 4.6 stars out of 5.0 on Amazon. Verified buyers like the large size of these bottles, as well as the high quality of each component. Others commented that the spray heads are of good quality and delivers just the right amount of liquid. However, some people complain that the product might have problems spraying thicker liquids. Others warn interested buyers that the sprayers only spray in a stream, so it might not be perfect for people who want a fine mist sprayer. Prices for this set of two bottles range from $ to $$. If you’re still figuring out what type of containers you want to use for your essential oils, or if you’re looking for variety, then the PureLife Essential Oil Accessories and Bottles will be perfect for you. This set includes four different types of bottles in different sizes. It also comes with everything you need to package your essential oils. The kit consists of bottle openers, droppers, waterproof labels, circular labels, a metal funnel, and a microfiber cloth. 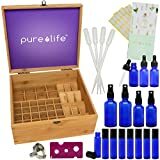 The PureLife Essential Oil Accessories and Bottles get a perfect 5.0-star rating on Amazon. Customers love the variety that they get from this set. Others like the reasonable price: between $$ and $$. 24 Pack, Removable Stainless Steel Roll on Bottles with Black Cap. Perfect for Applying Diluted Essential oils,Perfume Oils or Other Liquids. Smooth Rolling Stainless Steel Ball For Easy Brings You a Good Using Experience. StarSide gives you six roller bottles that can hold about a third of an ounce of essential oil. 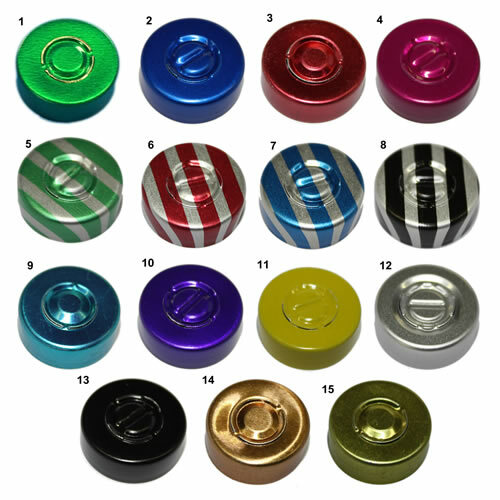 These amber containers have a removable glass ball, which some prefer over stainless steel or plastic rollers. The set also comes with droppers. This set gets an average rating of 4.4 stars out of 5.0 on Amazon. Verified buyers like how tight the ball rollers are, ensuring that your oils don’t leak. Other love the portable size and high quality of the bottles. However, some people complain that their package arrived broken and that they didn’t have any way to contact the seller. Pricing for this set of six amber essential oil bottles ranges from $ to $. Fomei Oil Bottles are perfect for product samples. These are very small bottles that have a capacity of 0.07 ounces. Each bottle comes with orifice reducers and black caps. 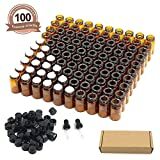 This set includes 100 amber glass bottles. It also has two glass eye droppers that help you transfer your oils without spills. 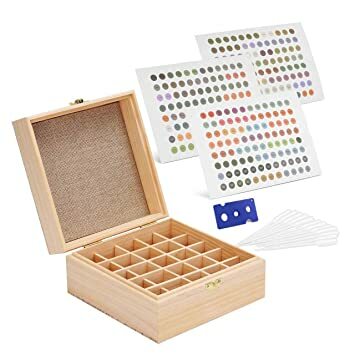 This set receives a rating of 4.4 stars out of 5.0 on Amazon. Verified buyers attest to how these bottles don’t leak. They also love the orifice reducers that have their own caps, which prevents your essential oils from leaking. However, there are complaints about how they received less than 100 bottles with their order. Meanwhile, others report that a few bottles or the droppers were broken when they got their order. The ljdeals Green Essential Oil Bottle includes 12 glass bottles with a black cap and a Euro dropper. These green essential oil bottles have a capacity of 0.17 ounces. If you’re looking for affordable containers for your products, then this is a good choice. Pricing for the ljdeals Green Essential Oil Bottle ranges from $ to $. That’s less than a dollar a bottle. Further, this set of green bottles receives an average rating of 4.4 stars out 5.0 on Amazon. Verified buyers like how cute these bottles look, and the green color complements its attractiveness. Green is a flight from the usual amber or cobalt blue color in essential oil bottles but still helps to protect your oils from UV rays. Positive reviews also talk about how portable these bottles are. However, some reviewers warn others about missing or broken bottles, while there are also complaints that talk about the plastic inserts not working well. Anyone looking for essential oil bottles that can accommodate up to an ounce of EO should check out this set of Yesker Amber Glass Bottles. With prices ranging from $6 to $8, this set includes six amber bottles, and each one comes with a glass pipette. The eyedropper allows you to get an accurate amount of oil that you need. On Amazon, the Yesker Amber Glass Bottles get an average rating of 4.2 stars out of 5.0 from more than 1,500 reviewers. Verified users love how these bottles are very durable, while others like the pipettes that allow them to dispense an accurate dosage. People also like that there is very little clearance between the end of the dropper and the bottle’s bottom, so you can use every drop of whatever liquid you put inside. However, some reviewers warn interested buyers not to turn these bottles upside down because it can leak. Others even say that simply shaking the bottle can cause it to leak. Looking for essential oil bottles that will make fabulous gifts? Get the Peace Essential Gemstone Essential Oil Roller Bottles. These bottles have natural crystals and precious stones as ball rollers. These are great for those who want to combine essential oils and Chakra cleansing. These roller bottles use authentic gemstones, but they’re still very affordable. A set of 12 bottles with 12 different crystals or precious stones will cost you anywhere from $$ to $$. Imagine coming up with such beautiful bottled essential oils while paying less than $2 for each bottle. 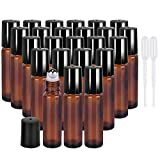 The Peace Essential Gemstone Essential Oil Roller Bottles receive an average rating of 4.6 stars out of 5.0 on Amazon. Verified buyers love how pretty these roller bottles are and how smoothly the crystal rollers can glide. They also say that these roller bottles make the perfect gifts. They also commend the company for donating a part of the sales to charity. However, some people complain about how the crystals fall out, and that they can’t put it back in. Others warn interested buyers that some of the rollers don’t work correctly. The Kare & Kind Refillable Essential Oil Bottle Kit is for those who are starting out with aromatherapy. 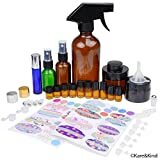 This kit comes with 16 essential oil bottles of different sizes, three sprayers, 78 labels and stickers, 16 caps, a mini funnel, and two mini droppers. In short, it has everything you might need, no matter what product you are making. For instance, there are two jars here that can hold lotions and emulsions you make with your essential oils. There are also roller bottles and two big Boston round bottles. There are also smaller amber bottles that you can use for your samples. Each one of these bottles has the necessary accessory as well, such as ball rollers, orifice reducers, and caps. On Amazon, the Kare & Kind Refillable Essential Oil Bottle Kit gets an average rating of 4.2 stars out of 5.0. Verified users love the excellent quality, heft, and thickness of the glass, plus they also appreciate how the kit has the accessories you can use to bottle your essential oils. This kit is just perfect as a starter set. Other like the variety that it offers. However, some reviewers note that the sprayer stops working correctly after only a short time of use, while others complain that some of the bottles leak. The prices for this kit range from $$ to $$. When it comes to essential oil bottles, there is something for everyone. 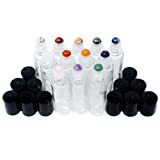 If you’re looking for cost-effective containers, then check out the ljdeals set of 12 essential oil bottles. If you’re giving diluted essential oils as gifts, then consider the Peace Essential bottles with the gemstone rollers. No nonsense sellers of essential oil blends and other products should consider the Nylea set of 24 bottles or StarSide’s set of six. Entrepreneurs who want to give samples of their products can use the Fomei Oil Bottles. On the other hand, there is Yesker for those who are looking for bigger bottles.The other suggested essential oil bottles are perfect for different purposes. For instance, if you’re making DIY household cleaners infused with EOs, then you should consider the 1790 spray bottles. Lastly, if you can’t decide just yet what type of container to use, then you can experiment with either the PureLife or the Kare & Kind kits. Do you have a favorite set of essential oil bottles? Tell us about it in the comments!